When participating in DigPins was originally pitched to me, I had some hesitations. See, I’m one of those librarians that has carefully guided their career to avoid the inside of a classroom—we exist mostly on the collection/tech side of libraries. Despite avoiding the classroom, I have become interested in what is going on in the classroom, especially around OER, textbook affordability, and library resources. While we have focused on the beneficial partnership between open pedagogy and OER, I thinks it is also important to dig into what might be the first step of this process for many—finding and adopting an OER. Finding an OER you want to use is often the most difficult step of the process. 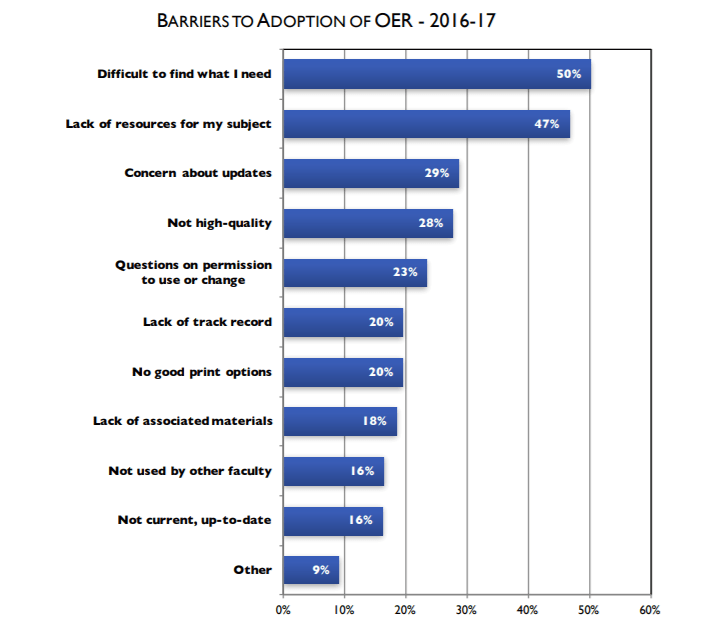 In fact, for three straight years in a survey on OER in US higher ed. faculty members have reported it as the biggest barrier to adoption. Libraries and librarians are playing a key role in OER discovery by assisting with the development of platforms like the Open Textbook Library and by becoming participating members in the Open Textbook Network. Librarians are also serving as curators of OER resource lists for their campuses—UW-Milwaukee and NC State – and by preserving and storing OERs in library managed institutional repositories. By placing OERs in institutional repositories, they are preserved locally and easily discoverable by local users with existing library search tools and broader user when institutional repositories are indexed and made discoverable via Google Scholar. With some librarian meta-data and discovery know how, librarians are also creating homegrown solutions to search across the various platforms that contain OER materials. While not perfect, these sort of discovery interfaces take direct aim at the major barrier to adopting OER and bring in results from the various platforms that house OER materials in hopes of providing users with an easier discovery experience. One example of this is George Mason’s Metafinder tool. 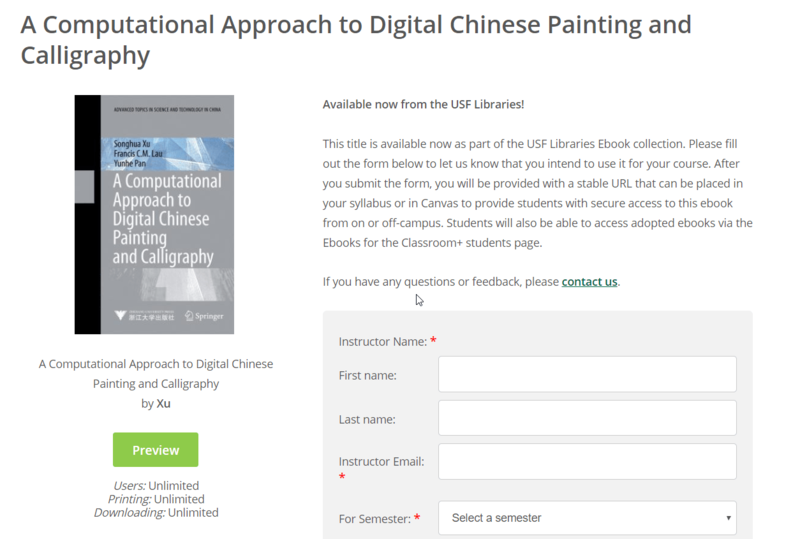 I know this deviates a bit from what’s at the heart of our discussion on open pedagogy and OER but my favorite example of libraries connecting users to alternatives for traditional textbooks–and a great example of the direction that textbook affordability will go until OER are more widely adopted–is what the University of South Florida Library is doing to push faculty members toward easily adopting E-books for the classroom. (Disclaimer: The search within this platform provides results for both OER textbooks from the Open Textbook Library and Library e-books that are not available via open licensing. While not open like OER, Library e-books can be adopted by faculty and used at no cost to the student–well, the library pays for them but we have always said that our collections are based on the curriculum). From this one simple search platform, faculty members can identify relevant materials, adopt them for the classroom and get the necessary links to embed the materials in a syllabus and/or their course management system. Pretty dope. Here is a look. Great post, Mitchell. You nicely articulated the key role libraries are playing in the OER movement. Our establishment of SNC’s IR, Digital Commons @ St. Norbert College https://www.snc.edu/library/digitalcommons.html was intended, in part, to help us do this kind of work at St. Norbert. We are just getting started, connecting with faculty about the opportunities is a key element as we move forward. Your post can help facilitate this process. I have a passing familiarity with SNC’s Digital Commons because they were discussed in a grant we submitted last year. What role do you see (or would you like to see) SNC play in the OER movement?